A contemporary and edgy wavy sterling silver torque bangle combining a hammered silver effect with a highly polished silver, creating a beautiful and elegant bangle. 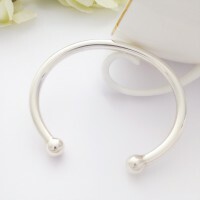 The Caitlin Curved Torque is a gorgeous solid sterling silver bangle that has a beautiful curved design and a blend of textures which makes this an edgy, funky torque, perfect for ladies who love interesting silver bangles. The inside of this silver wavy torque has a flat and smooth polished finish and it looks fabulous on! Torques make perfect gifts for women who love bangles, as they are suitable for most ladies wrist sizes. The Silver Wavy Torque is made from 925 sterling silver and is UK hallmarked. The Caitlin Wavy Torque measures approximately 9mm wide at its widest point. The internal diameter measures 60mm and the gap between ends measures 30mm.